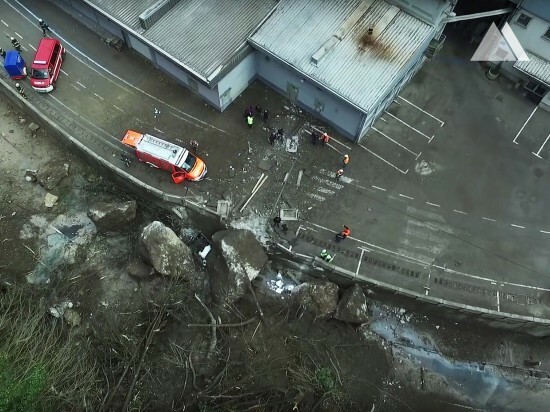 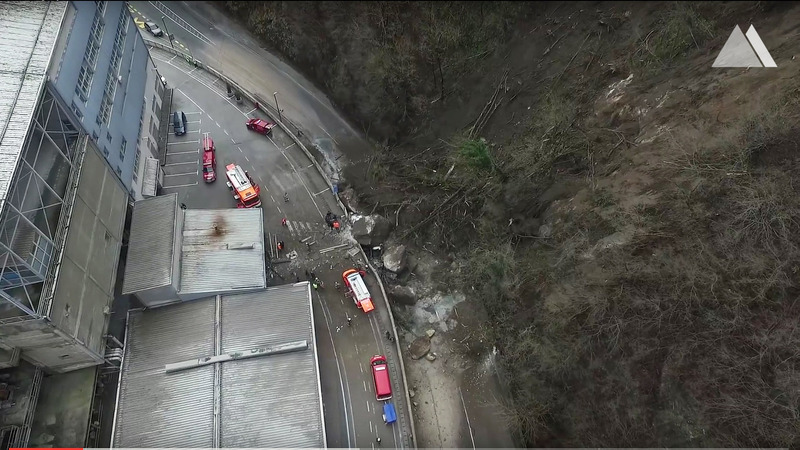 On 20th February 2016 over 500 cubic meters of rock and debris collapsed onto the district road between the county seat Trbovlje and Ljubljana. 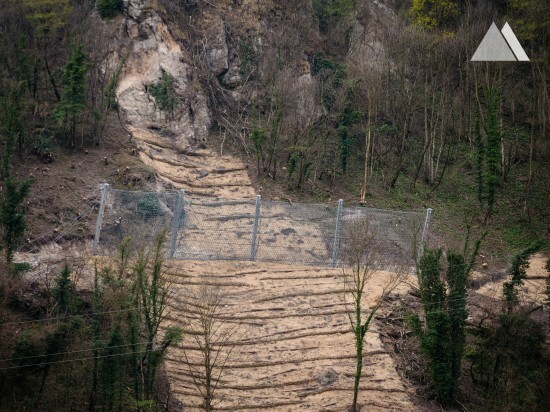 Not only was the important road blocked, the residents were also cut off from electricity and water. 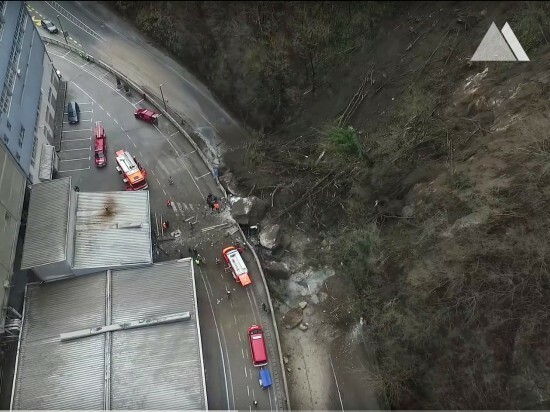 The debris removal on route R1-223 had to be completed in the shortest possible time, but first sustainable protection measures needed to be developed and installed. 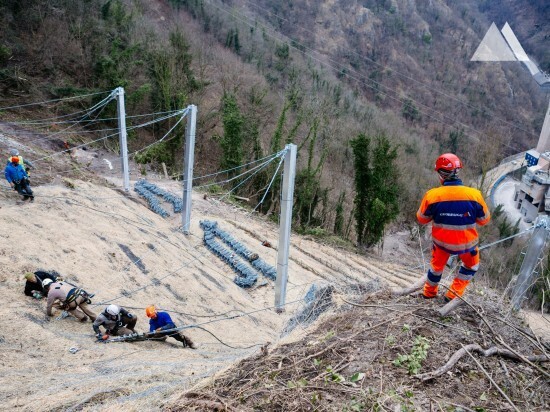 Site investigations and software analysis conducted by geologists and engineers indicate a significant hazard potential. 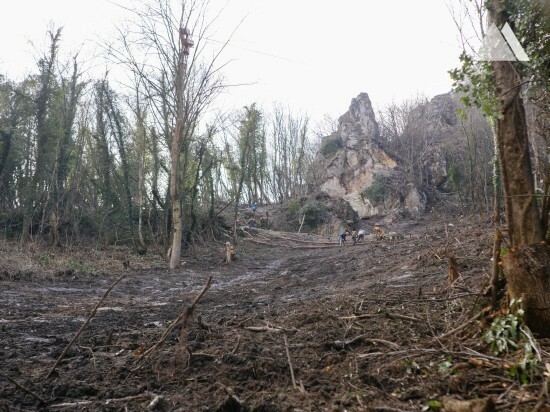 The heavily fractured residual rock mass at the mountain top cannot be taken down as it could damage an important nearby railway. 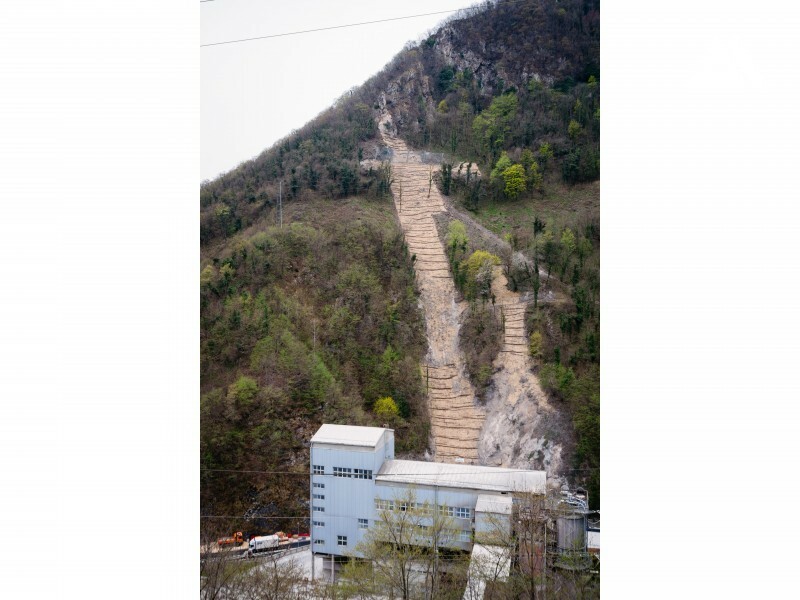 However, parallel to the site investigation and software analysis, limited rock scaling was also being performed. 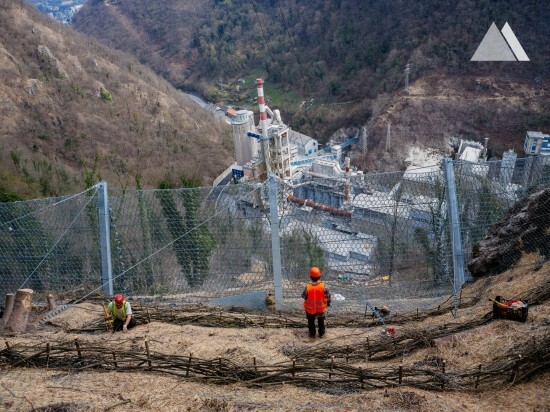 Construction commenced on March 8th with rock drilling to install anchors and base plates for the barrier’s post foundations. 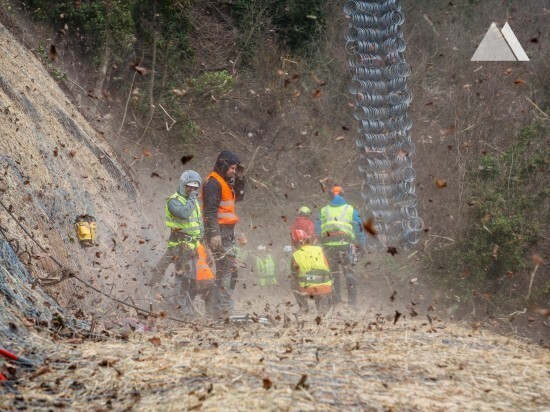 Based on the study results national authorities decided to apply a Geobrugg rockfall protection system from the RXE-Series. 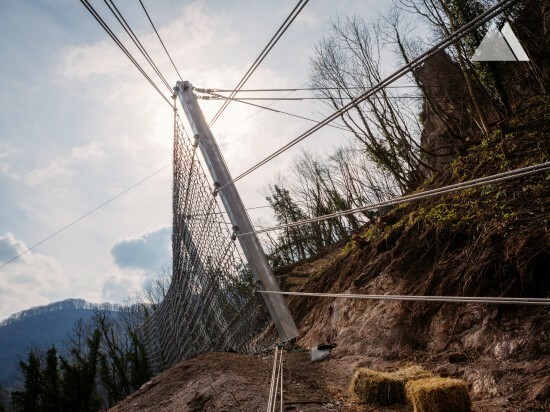 With its ring nets made of high-tensile steel wire the barrier design has been tested and approved to absorb impact energies of up to 8,000 [kJ]. 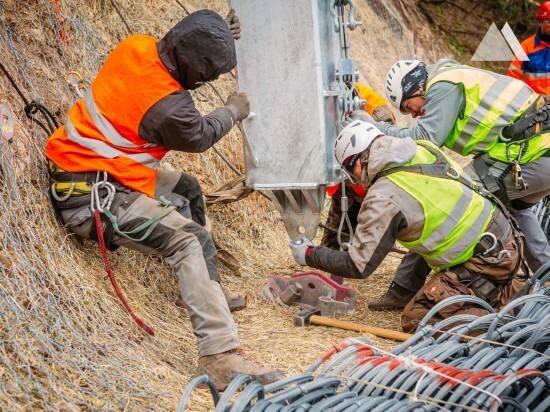 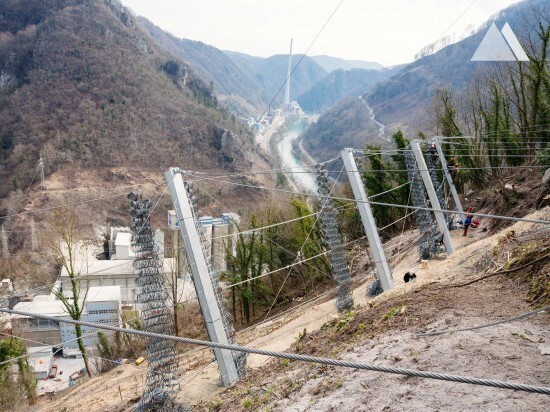 Additionally, two GBE-500A systems were selected to protect the lower part of the slope. 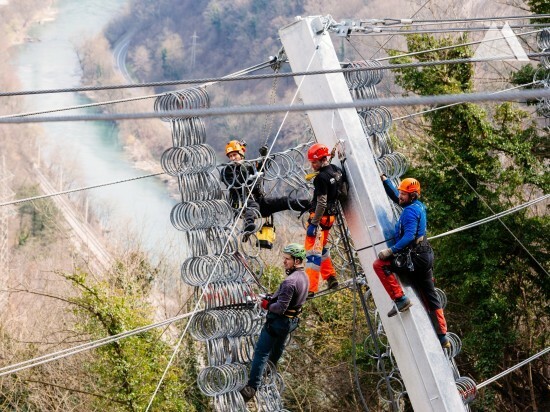 The posts, ringnet’s ropes and accessories produced and pre-assembled in Romanshorn, Switzerland, were already delivered to Trbovlje by mid-March. 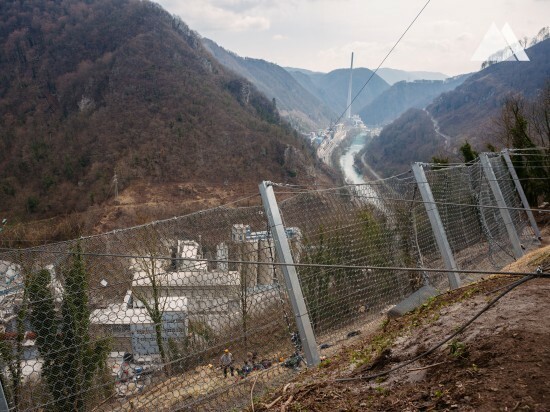 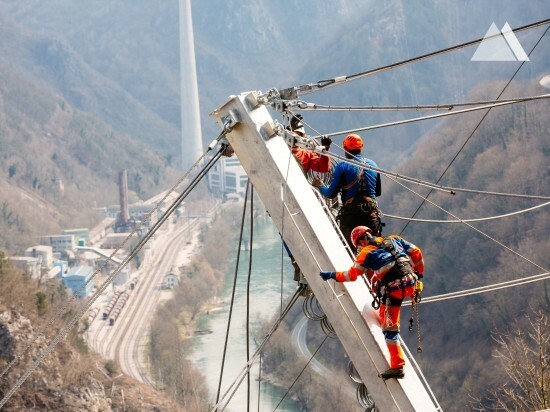 The biggest helicopter of the Slovenian Armed Forces delivered the four preassembled ring net bundles along with the five posts, weighing almost 2 metric tons, to the heavily inaccessible terrain. 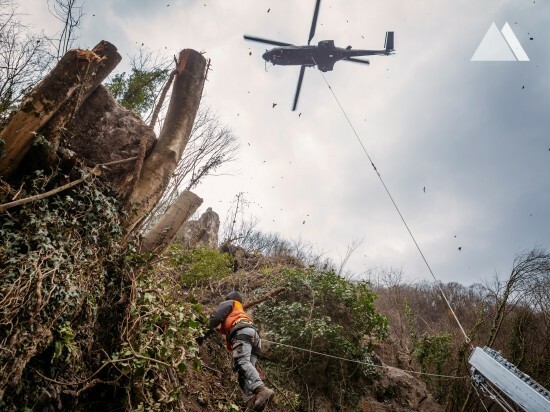 Despite high winds the helicopter crew made the decision: “We’re flying!” The experience of the entire ground and helicopter crew was needed to connect the posts to the base plates within a millimeter of accuracy. 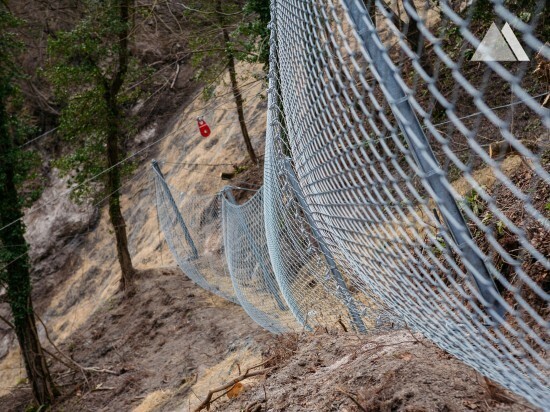 The mega-barrier technical acceptance inspection took place on April 4th, the same day officials, stakeholders and the public are welcomed to the inaugural reopening of the newly repaired and secured road.